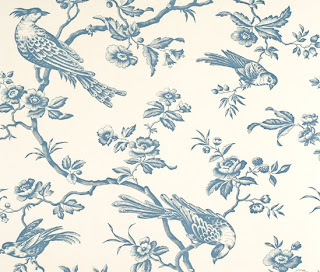 A Charmed Wife: I heart...Birds! One of the things that made me fall in love with our new apartment is our lovely upstairs master bedroom. It's on the top (sixth) floor of the building, and has a whole wall of windows onto the terrace, which makes it feel like a treehouse, or a bird's nest or (for you SAT word-lovers) an aerie. When we started decorating the room, my little literal heart couldn't resist this pretty wallpaper from French Country mecca Pierre Deux. I'm always drawn to busy pattern, which can get overwhelming in a smallish space, so we limited the paper to one wall. I also couldn't resist the bed, which reminded me of a big ol' birdcage, and has the added advantage of playing to my childhood canopy-bed obsession. There are several versions of this bed out there right now, including one from Anthropologie, but I got ours for a bargain basement price from the Pottery Barn Teen catalog (which is really only slightly embarrassing). It came in a less sophisticated powdery white color, but with one semi-unpleasant afternoon and 3 cans of black matte spray paint I was able to remedy that quite satisfactorily. Further evidence of my avian obsession are the four bird prints we have hanging at the top of the stairs. Apparently, Singer sewing products used to give out these collectible cards with their threads and whatnot as a sales gimmick in the 1920s. They are like baseball cards, but with birds on them- they even have facts about the different birds on the back, like player's stats (this Yellow Breasted Chat, for instance, is capable of mimicking the songs of other birds). Evidently, the bird-card collecting craze has passed, because I bought these on eBay for a couple of bucks, and stuck them in cheap 4x6 frames from Bed, Bath and Beyond. Not that I was searching "birds" on eBay or anything. This is brilliant! i love the spray painting idea, but how long will the paint last? How did you spray it on evenly without getting paint all over the place? This amazes me. The paint should last forever (or at least as long as the bed)- the spray paint is designed to adhere to metal. I painted the individual parts outside on our little terrace, which I covered in a drop-cloth) before the bed was assembled. It only takes about 10 minutes for the paint to dry completely.